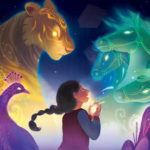 The third release from the Rick Riordan Presents banner, Dragon Pearl by Yoon Ha Lee, takes readers on a page-turning cosmic adventure through the galaxy. In this story there are ghosts, goblins, dragons, foxes, and tigers, that can all assume human form, and use their magic and abilities to survive in the world. Dragon Pearl is about a 12-year-old girl named Min, who learns that the older brother she adored, Jun, has deserted the Space Forces. Refusing to believe the investigator, Min flees her desolate home on the planet Jinju, a planet that was not fully terraformed and hardly a paradise for anyone. With few resources, frequent dust storms, and the constant need to fix broken materials to help the family get by in a tough world, Min finds herself allying with mercenaries, attacked by pirates and waking up on the Space Forces ship that her brother served on. Using her fox abilities, Min takes the form of a dead Space Forces cadet Jang. With his ghostly apparition giving her permission for the ruse, Min takes on a new life, navigating a world where she is searching for her brother, and trying to appease the ghost of Jang. Looking like Jang, and applying charm magic when needed, Min assimilates into the ship life, only to learn that something happened to her brother. Whether he deserted or was on orders form the captain of the Pale Lightning, Jin has been mixed up in a scheme to find the mythical Dragon Pearl, an object of unbelievable power. Used properly, the Dragon Pearl can terraform worlds and bring life to dead rocks. In the wrong hands the Dragon Pearl is an unstoppable weapon. Min’s journey brings her to the Fourth Colony also known as the Ghost Colony, a world possessed by ghosts. Min, with assistance from two of Jang’s friends, Haneul and Sujin, will risk everything to find the Dragon Pearl and learn the truth about her brother Jin’s actions. When Rick Riordan Presents was announced by Disney/Hyperion, the goal was to introduce new authors telling stories related to the mythology and culture of their ancestry. The maestro of mythology would promote, and help further these stories along, and now with the third book from the imprint, Dragon Pearl, the readers that have come to love all things Percy Jackson are getting a taste of Korean mythology with this rollicking action-packed science fiction adventure from author Yoon Ha Lee. Yoon, who spent half his childhood living in South Korea, grew up hearing tales about a Dragon King who lived under the sea, goblins with magic clubs and fox spirits who are dangerous and cunning thanks to the storytelling magic of his parents. He also grew up a fan of all things science fiction and with Dragon Pearl not only has Yoon introduced elements of Korean folklore, he has crafted an engaging and imaginative story that will hook readers with its relatable characters. Set in a galaxy dominated by the Thousand Worlds Space Forces, the mythological Dragon Pearl item can terraform planets. This galaxy is ruled by the Thousand Worlds Space Forces which has its only battles with the politicians who may only want what’s best for them and not the people in the galaxy. From scheming politicians, magical creatures, mercenaries, we meet a young girl named Min, who misses her brother and knows he would never desert, so she goes in search of him. From first page to the last, readers will be enraptured with Min’s story of adventure. The heart of this story is not about space battles or interstellar travel, but what one is willing to do when a family member is in trouble. Min and her brother Jun are desperate to escape the desolate world of Jinju. Forgotten and unfinished in terraforming, the Thousand Worlds Space Forces offer them a chance for a better life. When Jun goes missing and is suspected of desertion, Min will travel the stars to find him. I have always found Rick Riordan’s novels so enjoyable because they not only incorporate ancient myths in modern day settings, the characters display modern day qualities and are relatable and appealing to the reader. Dragon Pearl is about the quest to find Jun, but we get to watch the change in Min and how she grows. From being a lonely girl controlled by her dominating mother, we watch as Min discovers her abilities, pushes herself beyond what she thought she could do, and ultimately becomes a different person. Min is likable, and as a reader, you root for her success. We want Min to succeed because we have all felt like Min – parents who don’t understand us, adults who don’t trust us, and friends who may betray us. Min is living a life of accelerated growth. Her journey and how she goes from using fox magic to help her succeed, to just using her own wits and courage is something a reader will cheer for. When Min impersonates the dead Space Forces Cadet Jang, she gets to develop real friendship with Jang’s fellow cadets, Haneul and Sujin. Their friendship is typical of young cadets in the military. They break rules and get put on toilet scrubbing duty. Extra points must be given to the humor that Yoon brings into the story and how he turns toilet cleaning duty as hilarity. 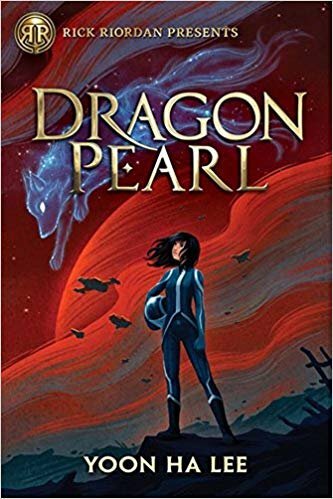 The quest for the mythical Dragon Pearl is a standard narrative setup, but author Yoon has crafted such a finely tuned narrative that Dragon Pearl can stand alone as an excellent story or be the start of a lengthy space saga that allows readers to watch Min grow into an adult. The mythology of the one powerful magical item that can create a marvelous wonder, or bring destruction depending on who controls it, does not control this story. Yoon’s work is not only creative and imaginative but his homage to many famous science fiction stories also allows him to build his own tale that will engage young readers. With space battles, pirates, and a quest for the one all-powerful item in the background, Yoon has written a book that is a tale about growing up and finding your inner strength. Readers are very fortunate these days. 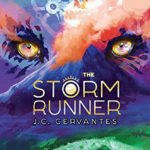 With Disney/Hyperion’s push for more diversity in their catalogue, and using Rick Riordan to help further these stories, there is an abundance of great literature waiting to be discovered. Dragon Pearl by Yoon Ha Lee is the third publication under the Rick Riordan Presents banner which has been solidified as quality literature for young adults. As a parent, I am excited for the day when my kids can pick up these books and get lost in the worlds imagined by their authors. As a teacher, when I see my students reading a Rick Riordan book, or a Rick Riordan Presents book, I know they are reading quality literature with characters who are positive role models. When the kids are done reading the parents will want to pick up the books and read them too. 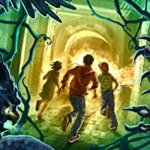 Rick Riordan Presents has hit another home run with their third outing. I highly recommend Dragon Pearl by Yoon Ha Lee as a 4-star space opera that will make you think of another adventure that is set in a galaxy far far away.